This Just In…: Introducing Stella & Chewy's New Flavors! Introducing Stella & Chewy's New Flavors! New Flavors of Stella & Chewy's at Tails in the City! 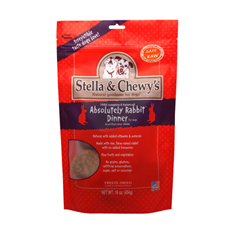 Introducing two new flavors of Stella & Chewy's freeze dried dinners. 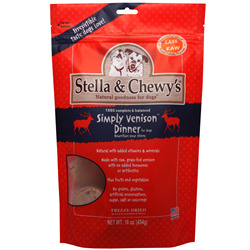 We are pleased to bring you Stella & Chewy's Freeze-Dried Simply Venison Dinner as well as Stella and Chewy's Freeze-Dried Absolutely Rabbit Dinner! Tails in the City dogs love Stella & Chewy's! Try it today, your dog will love it too! Stella & Chewy's Offers 100% complete and balanced nutrition. When you check the list of ingredients in Stella & Chewy's freeze dried dinners, you’ll see it reads like a “who’s who” of wholesome, healthy stuff. Like raw, naturally-raised meat, poultry or fish, sourced from USDA-inspected facilities. Organic fruits and vegetables such as cranberries, carrots, apples, spinach, broccoli and beets. Healthful, direct-fed microorganisms (probiotics), natural tocopherols, chelated trace minerals and taurine. Plus essential vitamins and minerals. And for your complete peace of mind, every ingredient is sourced from reputable suppliers. What you won’t see are any of the usual suspects, like grain, fillers, artificial preservatives, colorings, added hormones or antibiotics. We don’t even add sugar or salt!